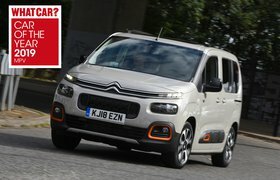 First Drive: Citroen Berlingo | What Car? 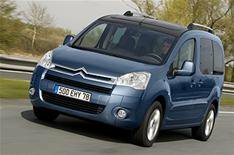 Citroen's Berlingo is the automotive equivalent of Crocs plastic clogs: a comfortable, practical way to travel, a hit with families and ugly in a way that makes people smile. Yes, it looks like a van with windows, but if that's what you need, who cares? This is family car space for supermini money. Storage in the footwells, roof, dashboard and under the seats should satisfy the most dedicated hoarder. Opt for the Modutop roof and the car becomes a box of delights with aeroplane-style roof storage lockers or interior roof bars for your snowboard. Luckily, there's enough room in the cabin to prevent children and family pets from disappearing forever. The option of three separate rear seats makes this one of the few five-seat cars suitable for carrying three children in child restraints across the back. Two seats come with ISOFIX child seat mountings, and all can be removed. Sliding rear doors make it easy to get anyone in and out, particularly in cramped spaces. Tough plastics underpin the car's workhorse credentials, and you can add luxuries such as parking sensors, sat-nav and cruise control. The upright driving position is ideal for anyone nursing a bad back. However, we're surprised to see a family car with only two airbags as standard, and side airbags or ESP don't even make the options list for basic VT cars. Range-topping XTR models have slightly raised suspension, more rugged looks, and bigger tyres. Choose from 1.6-litre petrol or diesel engines in a variety of power outputs; the 90bhp diesel is perfectly perky. Only on poor roads is the ride bouncy, and despite all those windows, there isn't too much wind noise. If the new car seems just too fashionable, don't despair: the original Berlingo remains on sale as Berlingo First, with prices starting at £8695. • The new Berlingo is on sale now, and costs from £10,995.